Gangrene is a condition characterized by necrosis of a body part due to lack of circulation, injury, or infection. The tissue becomes depleted of oxygen and eventually dies. Many conditions may lead to gangrene; the most common are injury, peripheral vascular diseases (e.g., in chronic smoking and diabetes mellitus) and infections. It may also occur in certain blood disorders like polycythaemia. Gangrene is categorized as dry, wet, or gas. In dry gangrene, there is a classic line of demarcation between the necrotic and normal tissues. When the cause of the gangrene is in the blood vessels (e.g., in peripheral vascular disease and polycythemia), there is a clearly defined dead area with little or no discharge or pus. Wet gangrene often occurs in cases of infection and injury; the necrotizing area may be unclean; there may be swelling, discharge, and sloughing off of the tissue. This sometimes occurs even over an area of dry gangrene if an infection gets superadded. Gas gangrene is the specific infection from Clostridium perfringens, which releases gas-producing toxins; this causes bubbling of the tissues. Wet and gas gangrene spread very quickly. Furthermore, due to the bacterial toxins that are released, the resulting sepsis can be fatal in a very short period. These cases usually require amputation of the body part. However, in cases where such drastic measures may not be warranted, treatment includes debridement and wound care, revascularization and hyperbaric oxygen therapy. Here, we present 5 cases, in which the homoeopathic treatment prevented amputation of a body part. These patients were treated at Centre for Classical Homoeopathy, Bangalore, India. All the patients underwent regular dressing of the gangrene as a part of the treatment and no antiseptics, except Calendula officinalis mother tincture were used for the purpose of dressing. The study has been approved by the Ethical Committee or institutional review board and the subjects gave informed consent to the work. It has been carried out in accordance with the code of ethics of the World Medical Association (Declaration of Helsinki) for experiments involving humans. She complained of a chilly sensation in the body, and her extremities were cold to touch. Here, there was a specific behavior on her part that drew the attention of the homoeopath. She was unduly rude to her husband while, with others, her behavior was polite. On inquiry, the husband confirmed that she was mostly rude toward her family. The homoeopathic prescriptions for this case were Sepia, Silica and Sulphur in sequence over 3 months [Table 1] and [Figure 1]a-f. During this period, the wound steadily healed; after 3 months, she was walking without aid. She later continued treatment for her diabetes. This case was scheduled for knee level amputation. Hence, the healing of the gangrene and thereby preservation of the limb through homoeopathic therapy is remarkable. The circulatory stasis along with the indifference she showed toward husband indicated Sepia. It may also be noted that Sepia is one of the main remedies for cold extremities and for ulcers of the foot. The remedy was changed to Silicea on account of change in the nature of the discharge. Later, she started becoming thermally hot, and the blood sugar increased. She also exhibited ravenous hunger and hunger at 11 am. At this time, Sulphur was prescribed. A 45-year-old man with gangrene of the right little finger; [Figure 2](a-e). He was restless in bed. In this case, no other medication allopathic or others were employed except the ones mentioned here. 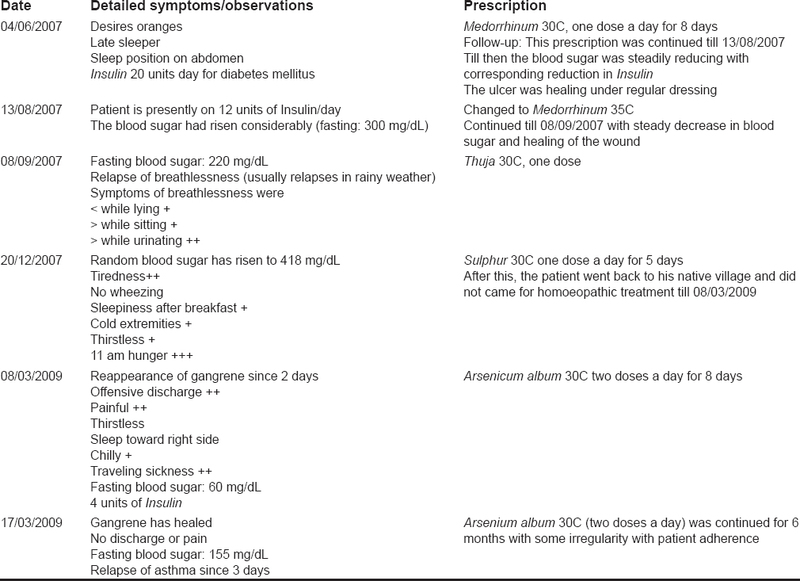 The homoeopathic remedy Arsenicum album 12C, 5 times a day for 1-month, was prescribed [Table 2]. The medication was not changed during the entire 1 month period after which the patient stopped treatment owing to complete healing of the gangrene. This case demonstrates the ease with which the gangrene heals in an uncomplicated case. Here, there was no diabetes mellitus, but there was a history of heavy smoking, which may have affected the distal vessels, leading to gangrene. Arsenicum album is one of the remedies that has putrefaction as its hallmark and is used extensively in septic conditions. The same remedy helped in this case too. The pathology and the symptomatology both were well covered by the remedy, hence the full and quick recovery. A 59-year-old male presented with relapsing diabetic gangrene; his right foot was gangrenous since 3 weeks. Two years prior, the same foot was gangrenous, and the second toe was amputated. The gangrenous foot was swollen with an offensive discharge [Figure 3](a-e). He slept late and on the abdomen. Medorrhinum helped this patient's wound to heal up, in 3 months [Table 3]. His blood sugar was brought under control as well with insulin reduced progressively and stopped. After 3 months, he discontinued the treatment as he lived in a different city and was unable to continue. Two years later, there was a relapse of gangrene in the same foot. Meanwhile, he had started taking insulin, which was keeping his blood sugar under check. At that time, the homoeopathic remedy Arsenicum album was prescribed [Table 3], and it healed in a month this time. Thus, he was treated successfully for gangrene twice. The first remedy Medorrhinum was prescribed based on the general symptoms that the patient exhibited (especially the desire for oranges, which was strong). Here, the case shows that he had a chronic condition running in him and that the gangrene was relapsing. This indicated that he needs to be given a deeper remedy, which can touch the basic layer of disease. Medorrhinum is one such remedy. Therefore, it cleared the gangrene and eased his asthma as well. His blood sugar also was brought under control. However, in this case, the gangrene relapsed again because the patient went back to Corticosteroids for his asthma as he could not continue homoeopathic treatment. The suppression of his asthma made the deeper pathology relapse. At this time, the remedy that was indicated was one that has sepsis and putrefaction. His other symptoms also indicated the same remedy. Moreover, indeed the gangrene healed well with Arsenicum album. A 66-year-old man with gangrene developing on the right foot [Figure 4](a-c). Doppler study impression showed that the right superficial femoral artery and popliteal artery were patent and had a moderate disease with biphasic flows. Right anterior and posterior tibial arteries were heavily calcified with poor/patchy dampened flows. Right mid posterior tibial artery showed a jet, suggesting high-grade stenosis. 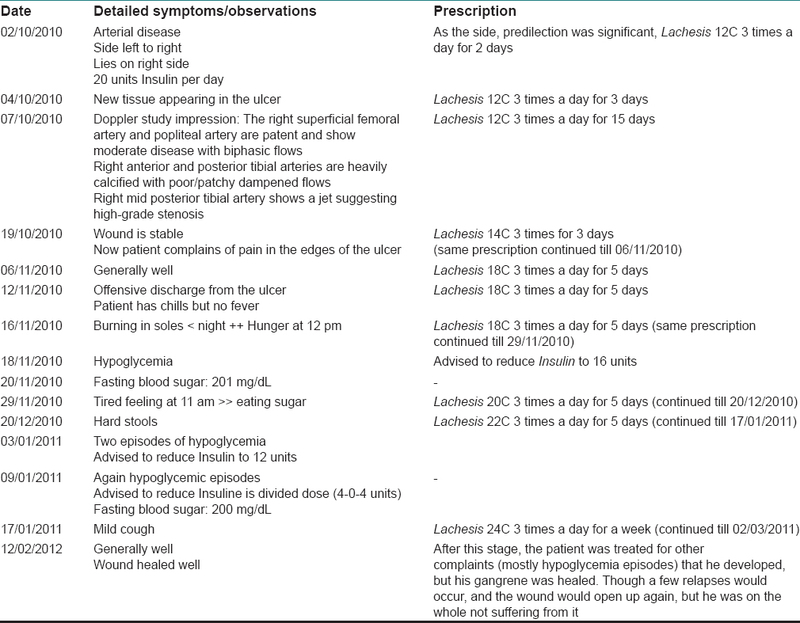 The homoeopathic remedy Lachesis helped in healing the gangrene stabilized it in 4 months [Table 4]. Lachesis is one of the remedies that have circulatory problems. In this case, the complete symptomatology and the pathology (arterial disease) were covered by Lachesis, but what was very strong was his side affiliation. The body showed a tendency to develop right sided afflictions after left-sided ones. He also had a strong inclination to sleep to the right. These were very important symptoms and directed the physician toward the remedy. This case was very bad in terms of prognosis and healing of the gangrene without amputation is remarkable. 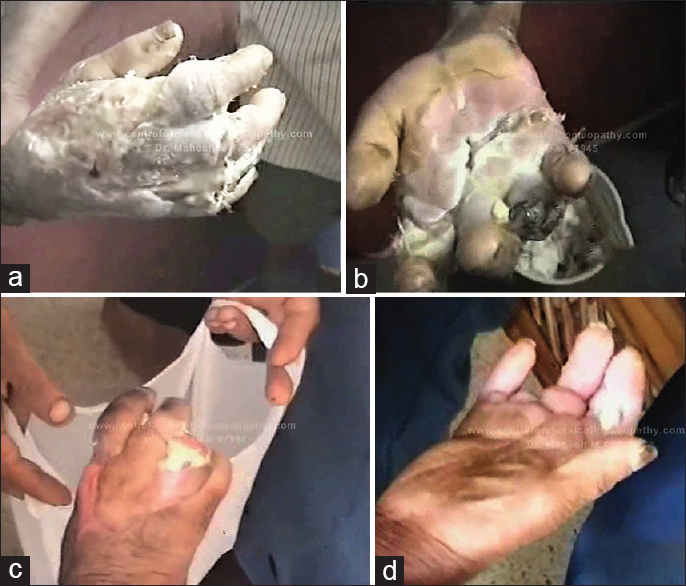 A 70-year-old man who was scheduled for amputation of his hand due to diabetic gangrene in 2004. Unfortunately, his case sheet is missing, and a detailed follow-up is difficult to report. 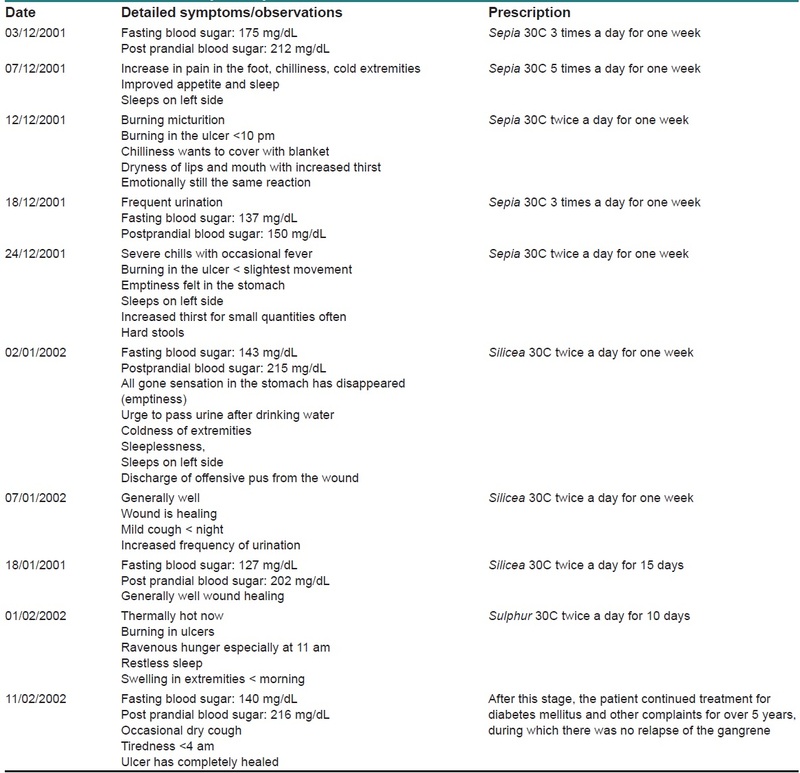 the symptoms recorded from the video discussion is mentioned [Table 5] and [Figure 5]a-d. The remedy Sulphur 30C was prescribed for 1-month during which the gangrene completely healed. Note: This patient was exclusively on homeopathic treatment. No other medicines were employed. This patient was from a rural background and as such had a very well preserved health status. His symptoms (general as well as local) were very clear and marked. He did not show any mixture of remedies (again indicating that he was very healthy). Therefore, considering general symptoms, Sulphur was prescribed which completely healed the gangrene in one-month. A human being is not compartmentalized into his organ systems. The body functions and reacts as a whole. Furthermore, the body and mind is one complete complex and must be treated as such in order to improve health outcomes. One's emotions and thoughts have a great influence on the function of the body. The immune system not only responds to stimuli from outside the body but also to those from within, even from the mind. Unless this integrity is recognized and honored, we may be limiting our treatment approach. By understanding the entirety of the human organism, any disease may be treated using the body's power to heal itself. Homoeopathy uses this power and pushes one's ability only as far as needed to overcome the disease obstacles. In the above cases, we consider nonhealing wound turning into gangrene. In chronic arterial occlusion or long-standing peripheral vascular disease, collateral circulation usually develops to compensate for the occluded or inflamed vessel. , In certain situations such as injury, new blood vessels develop as part of the wound healing process. This process is automatically regulated by the organism's defense mechanism. Indeed, wound healing is an orchestra of immune cells performing in perfect harmony and sequence. To heal a wound properly, a sequence of events must occur: hemostasis, inflammation, cell differentiation, proliferation and migration followed by angiogenesis and firm scar tissue formation. Immune cells like neutrophils, must also clear the wound site of cellular debris and microbes. T-cells also play a prominent role in wound healing and scar tissue formation. Therefore, wound healing is a multifaceted phenomenon. If any of the events in the wound healing phenomenon fail (even a little), a nonhealing wound results; it may progress to gangrene due to overbearing infection. In such situations, Homoeopathy is beneficial because its focus is to stimulate the immune system, to re-establish order. This is achieved by carefully understanding the disease and the patient's individual response to it and then by selecting a medicine based on this insight. In other words, Homoeopathy considers the totality of symptoms (even ones not obviously related to the pathology), along with the pathology itself. This makes for a holistic understanding of the patient's immune status. With the right homoeopathic remedy, the inflammation and wound healing process set in and finally close up the wound. Within a short period, the remedy heals the gangrene, controls infection, and establishes circulation. Furthermore, Homoeopathy is advantageous, because the general condition of the patient is preserved during this whole process of gangrene healing. In diabetic cases, one can also appreciate the control of blood sugar levels. Homoeopathy can help preserve the integrity of the organism to a great extent. Indeed, cases of seemingly inevitable amputation (by conventional medicine) may surprisingly respond to Homoeopathy and may be saved. However, the limitation to this method is the expertise of the homoeopath. To assess the condition and later the progress of the patient, the homoeopath must be well equipped with the knowledge of pathology and of homoeopathic laws. He also needs a keen observation, without which dealing with such potentially fatal cases is not recommended. Furthermore, practically speaking, time is a limitation. There is very little time for even the most accomplished homoeopath to take care of these often dire situations. Usually, a classical homoeopathic physician can assess the prognosis within 24 hours of the remedy and understand (according to the laws of cure) where the case will progress. However, in some cases, even this much time can prove fatal. There is no time to decide on the right remedy after a mistake. The above case reports clearly provide a rationale for the use of Homoeopathy in the treatment of gangrene. Importantly, it is essential to perform an interdisciplinary study of the gangrene cases treated with Homoeopathy using the latest imaging and pathology techniques. These case reports are indicative of what may be achieved with these pioneering treatments. The burden of amputation may be greatly reduced with further cooperation among therapeutic disciplines, and treatment can become holistic and patient-centric. Advancedamputees.com. Amputee Statistics You Ought to Know; 2014. Available from: http://www.advancedamputees.com/amputee-statistics-you-ought-know. [Last accessed on 2014 May 20]. Kurichi JE, Bates BE, Stineman MG. Amputation. In: Stone JH, Blouin M, editors. International Encyclopedia of Rehabilitation; 2010. Available from: http://www.cirrie.buffalo.edu/encyclopedia/en/article/251/. [Last accessed on 2014 May 23]. Cousin N. Anatomy of an Illness as Perceived by the Patient. 1 st ed. New York: Norton; 1979. Ertl JP, Brackett WJ, Ertl W, Pritchett JW, Calhoun J, editors. Medscape: Medscape Access; 2014. Emedicine.medscape.com. Available from: http://www.emedicine.medscape.com/article/1232102-overview. [Last accessed on 2014 May 20]. George V. Essence of Materia Medica. New Delhi: B Jain; 1990. Vithoulkas Compass. N.P; 2014. Available from: http://www.Vithoulkascompass.com. [Last accessed on 2014 Feb 23]. Samuel H, Boericke W, Krauss J. Organon of Medicine. New Delhi: B Jain; 1992. Kent JT. Lectures on Materia Medica. New Delhi: Jain Publishing; 1985. Vithoulkas G, Woensel E. Levels of health. 1 st ed. Alonissos, Greece: International Academy of Classical Homoeopathy; 2010. Macchi C, Giannelli F, Cecchi F, Corcos L, Repice F, Cantini C, et al. Collateral circulation in occlusion of lower limbs arteries: An anatomical study and statistical research in 35 old subjects. Ital J Anat Embryol 1996;101:89-96. Murrant CL. Structural and functional limitations of the collateral circulation in peripheral artery disease. J Physiol 2008;586 (Pt 24):5845. Gawronska-Kozak B, Bogacki M, Rim JS, Monroe WT, Manuel JA. Scarless skin repair in immunodeficient mice. Wound Repair Regen 2006;14:265-76.